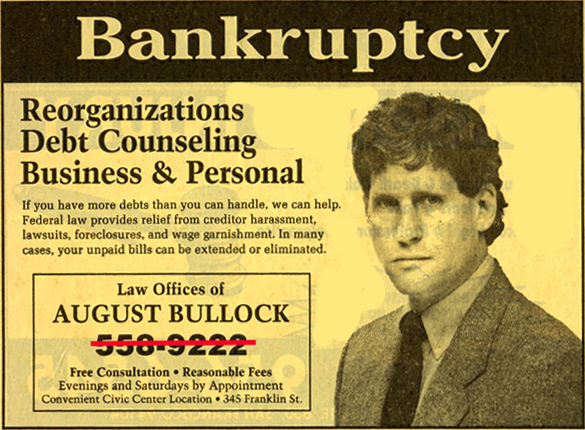 I have been a bankruptcy lawyer since 1988. This is my yellow page ad from back them. A gallon of gas was 98 cents, the Dow was 2168, "A Fish Called Wanda" was a popular movie, Ronald Reagan was president, and I hardly had any gray hair. Santa Cruz and San Jose Bankruptcy Attorney August Bullock serving Santa Cruz, Scotts Valley, Felton, Watsonville, Boulder Creek, Los Gatos, and San Jose. We are a debt relief agency. We help people file for bankruptcy relief under the Bankruptcy Code. Chapter 7 and Chapter 13. Copyright August Bullock; all rights reserved.